Uniquely Located On Wooded Ravine Lot W/61 Ft Frontage. Total Privacy. Spacious Bedrms. Benjamin Moore Freshpaint. Dining Rm Open To Above. 9Ft Ceiling Main Level. Custom Kitchen, New Countertop. Prof.Finished Bsmnt W/Steam & Spa System, Bar, 'Dolby Atmos' Theatre System, 'Log' Or 'Stone' Setting Fireplace. 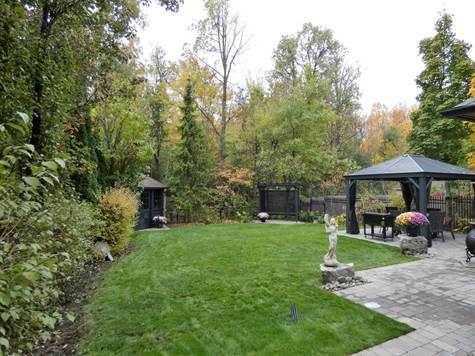 Gorgeous Private Backyard W/ Gazebo, Custom Built Bbq Station W/Ceiling Speakers. Extras:Stunning Backyard! Interlock'17, Roof '16, Furnace & Hwt (Owned)'16, Public Tv Via Antenna. B/I Dw, Hood Range. [Kitchen Aid Fridge, Oven, Cooktop-2018]. Samsung Washer,Dryer, 2 Gdo & 1 Remote, Custom Wndw Coverings,Two Fireplaces and much more .... A true Gem !